I needed a place to consolidate and store my carving Tools and Accessories. A friend of mine ran across a Japanese Style tool box that looked great and interesting to build. After watching several YouTube videos and a day laying out my design on graph paper I was ready to build one. The overall dimensions of the box are 12” high, 10 1/2” wide and 22” long. I have two drawers that open to the side for my carving chisels and two removable trays in the body of the box for small stuff. The box sits on four shop made feet. 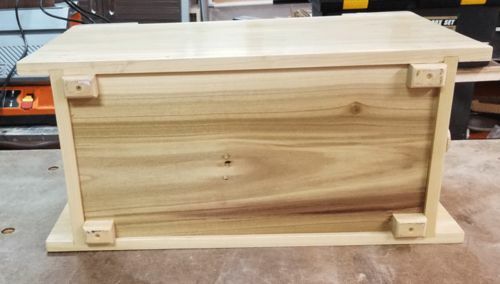 The box is held together with Tight Bond and over 140 dowels. 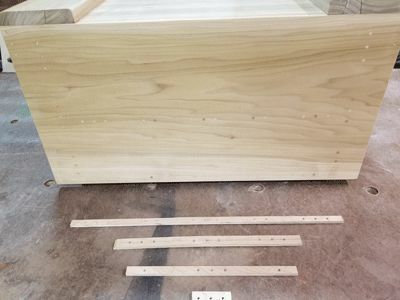 in order to perfectly align the dowels vertically and horizontally I used templates that fit the dados to mark and drill the holes prior to assembly. The strips in the photo above are the dado templates. The small one at the bottom is the template for the handle dowels. Note: This was the only way I could have aligned the dowels vertically and horizontally. The easiest video I watched was Japanese Toolbox for Beginners by John Zhu. He aligned his by measuring and marking where the holes should be after assembly. This was a non-starter for me so I came up with using templates and drilling my holes, using my drill press table, before assembly. All and all a fun project and a conversation piece when visitors visit the shop. Nicely done! Should give you years of good service. 140 owels! Wow. I just use nails on mine. (If you want to take a look its in my projects). They seem to be holding up fine. I like the drawers under yours. Drawers on a Japanese tool box! I wouldn’t have thought of that. I like the tray inserts too. I have built a couple of these, but never with trays or drawers. I could use another, actually… Might be stealing the tray idea! I prefer sharing, you are more than welcome to use any idea you get from the project you want. Enjoy! Beautiful. This should serve you well.